Gregory and the Brauhaus Band To Open Glenville Oktoberfest! 19 SepGregory and the Brauhaus Band To Open Glenville Oktoberfest! With less than 2 weeks to go, our 8th Annual Glenville Oktoberfest will open at 12 Noon with the tremendous sounds and entertainment by Gregory and the Brauhaus Band. Gregory has been featured in our main biergarten for many years and is a top favorite with our Oktoberfest crowd! 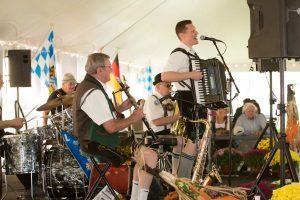 Join us at Maalwyck Park on September 30th to welcome back Gregory and his 4 piece Oktoberfest band! Alpine Thunder to Headline Glenville Oktoberfest!